With the Industrial Internet of Things (IIoT) making a push to become a bigger part of the manufacturing automation environment, being able to work in a secure environment should be something that is a given. Taking another step along those lines, Bedrock Automation is continuing its push for new, different and secure technology for the industry with its introduction of a secure standalone power supply. For those that don’t remember Bedrock makes a cyber secure automation platform based on technologies and skill sets from the automation and semiconductor industries to offer an automation solution for industrial control based on three ideas: Simplicity, scalability and security. With the IIoT offering such promise, operators can see what is happening at a facility anywhere in the world. Bedrock SPS.500 cyber secure standalone power supply, with sealed all-metal enclosure and IP67 connectors for Ethernet, power in and out, redundancy interlink and Dual Form C.
The SPS.500 Secure Power Supply offers cyber security authentication and onboard intelligence for diagnostics and secure Ethernet communications. 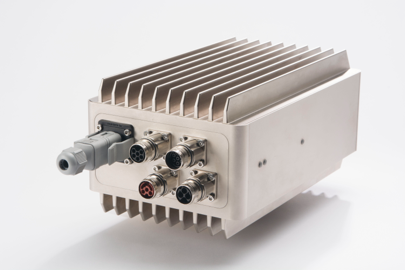 Encased in a NEMA 4X sealed aluminum enclosure, the SPS.500 can work anywhere in a plant and in harsh environments. Increasing onboard intelligence and Ethernet communications requires advanced cyber defense, which Bedrock Automation delivers with its embedded authentication and FIPS140-2 compliant anti-tamper protection. In addition, Bedrock designed the SPS.500 with extreme margins of safety and protection against the physical and electrical forces that induce accelerated wear. The SPS.500 comes enclosed in a NEMA4X hermetically sealed solid aluminum metal case. The enclosure allows for protection from severe EMI/EMP, as well as from extreme temperature, shock, vibration and ingress by water and solids. This approach inherently delivers FIPS140-2 anti tamper compliance for cyber defense. The physical hardening makes the SPS.500 applicable for remote or extreme applications across the spectrum of automation. The Bedrock Secure Power Supply provides single or redundant supply, using 90-264 V AC main voltage 50/60 Hz input. Its output of up to 500 watts is software configurable, between 21 to 28 volts. The SPS.500 Power supply is available immediately and can mount on pipe or a wall, occupying about the same foot print as typical 500-watt power supply with redundancy.